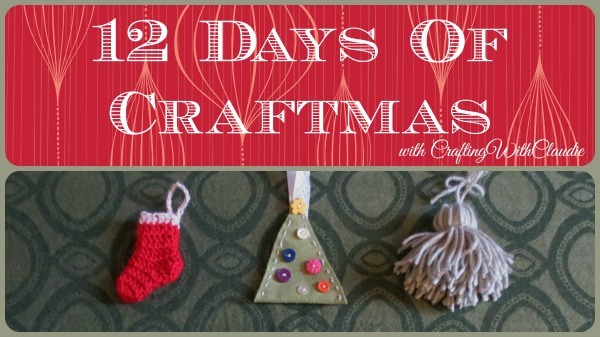 Crafting With Claudie: Introducing 12 Days of Craftmas! Introducing 12 Days of Craftmas! December will be here in 12 short hours! Can you believe it? Since the holidays are now upon us, I wanted to do something a little different and special this year. I thought it would be fun to do a video series and decided that ornaments would be fun, quick, and easy little projects to work in while we are all crazy busy. I'm calling it the 12 Days of Craftmas. Starting tomorrow, I will post a tutorial each day, for 12 days, showing how to make a new ornament. Some of these are very simple and some are a little more complex, but they're all adorable (if I do say so myself). You can expect the videos to post around noon EST. If you are not already, head over to my Youtube Channel and subscribe so the videos will pop up in your feed. You can also place this blog in your RSS reader of choice since I will be posting a blog post about each video. Some of the projects will include a written out pattern so you'll find those here. That's it! Well, other than you guys and gals getting in on the action and making the ornaments! I'm really excited about this as I've never tried to post a video every day for so many days in a row and I've never done a series like this. I'd really appreciate any feedback that you might happen to have and I'd love to know what you think about the ornaments. If you make them, please let me know. You can tag me on Instagram or leave me a message on Facebook (you can find all my links over on the right-hand side of the page) or just leave me a message and let me know how it went. Oh, and here's the short video I made announcing the 12 Days of Craftmas in case you didn't catch it over on Youtube. I hope you all enjoy!